Prepare to Be Blessed!!! A guide to your Body & New healthy life!!! If you've been searching for HOPE & A future... This book is a breath of fresh air! In a world where our bodies are suffocating from a toxic overload at every turn, you can learn a way of living that will save your life if you allow it! I truly enjoyed reading about how Dr. Keller was able to help his body heal from the same diagnosis that took the lives of his Father and Grandfather. 40 Years after his terminal diagnosis Dr. Keller is not just sharing his insight in this book (which is a blessing in itself), but he and his wife Rose make themselves readily available as counselors through your journey so that you don't have to go through it alone! This book and their kindness have changed the lives of my husband and I in ways we could have never imagined when picking up this book! I'm honored to have been given the pearls of wisdom Dr. Keller and Rose have shared in this book, and have been FOREVER changed by their loving example and service to their fellow man! May they be Eternally blessed for all they do each and everyday to make this information and themselves readily available to those seeking a life of health, healing, true joy and fulfillment! Setting Yourself Apart from the Seeds of Cancer is an answer to prayer for me. I've spent so much money and time on different methods of detoxing over the years with no results. I was diagnosed with cancer in June of 2011. I knew in my heart that I didn't want to undergo chemotherapy or radiation. I've seen too many people looking like death after chemo and radiation. They look worse after the treatment than they did before. This was intensely frightening to me. I did a lot of online research because I wanted to know how I ended up with this disease and how to get better without cutting burning and poisoning myself. After many days of searching, I tried once more and I saw a website that I hadn't seen before. It was Natural Healing Techniques. I found out about the book and I immediately ordered it through Amazon for a two day delivery. I couldn't wait to read it. After reading and rereading this book and actually following the guidelines of Dr.Keller, I have experienced results that I never have from any other method of treatment. I see the truth in Dr. Keller's approach and for once I can say it makes sense and it is working for me. The program outlined in this book is designed to get to the core of why we are ill and so off balance and what we need to do to reclaim our health. I like the spiritual aspect of it as well. It was a long time coming. This book will definitely set you free to begin again and live a healthy life. This is the kind of book you can't not tell people about - and you'll be posting your little epiphanies on Facebook as you read like I did. I was in about Chapter 3 when I already had a friend in line to borrow the book when I was done. It's such an inspiring book for those who are really serious about changing their lifestyle to foster health and well being. And for those who aren't serious, just dabbling in wanting to know more, it's an arsenal of information you will draw from again and again. ALSO the spiritual aspect of this book intrigues. It's written from a Christian perspective (with a Jewish background) yet is relevant to anyone seeking to overcome significant illness in their life, or prevent illness. Awesome book. I want to go to Belize and meet these people! A must read for those who are sincerely interested in improving their health and avoiding health issues. Easy to understand, concise and to the point. You are the only person who can actively change your health. Do yourself a favor, read this book and share it with a friend. I have read many health and healing books. But this book does what I have often wanted, which is to combine the best of many into one. The author does not seek one cure-all program, but instead takes the best from the best. He studied the works of Dr. William Kelley, Dr. Max Gerson, Dr. Bernard Jensen, and Dr. Carey Reams. Then he works these into an easy to understand format that any serious seeker of health can understand. Dr. Keller explains how our bodies work, why we get sick, and how we can heal. He then teaches the basics of a healthy diet, with healthy food preparation, as well as how to reduce stress. This book will not disappoint you. After reading the book: Setting Yourself Apart from the Seeds of Cancer - A Natural Heath and Survival Guide, I would like to recommend it to anyone who is pursuing better health with a spiritual center. The Keller’s have presented a thorough approach to regaining health for the individual who will take seriously God's design for life and health on this planet. Whether the reader agrees with every view set forth in this work is beside the point. The seeker will find in its pages answers for their general health and specifically for cancer prevention and survival. I see it as a must read for every seeking believer who desires Father's best for health and life. Great testimony to the grace and power of God. There are books such as "New Earth" by Eckhart Tolle that are written for awakened people in this changing, evolving world. Dr Morris Keller and his wife Rose have achieved such with this book. If you are the ostrich type, with your head in the sand, this book is not for you. If you feel responsible for your own health and your well being, then this book is for you. This book is part personal story, part facts, part spirituality, and part reference manual. There is just too much good information to single any of it out. Yet this book will help you live a more self sufficient life, and give you greater control of your health. My personal observation is that the best Cancer treatment books are written by those who suffered from the disease. Setting Yourself Apart from the SEEDS of CANCER by Dr. Morris F. Keller and his wife Kathryn Rose is no exception. Dr Keller’s brush with cancer was some 40 years ago and it was no cakewalk. Keller survived, personally cured his cancer and now writes about his journey. And, his how-to cure cancer book is no sales pitch for some Madison Avenue corporation seeking to enrich it’s self by selling you the so called “silver bullet”. Instead Dr. Keller has laid out the nuts and bolts of how dedicated and judicious one must be in educating themselves on the causes of cancer as well as the cures. Along the way Morris studied the cancer curing giants of the last century (including Dr. William Kelley & Dr. Max Gerson) learning how to cure not only his own personal cancer challenge but how to teach anyone the techniques and protocols he personally followed. And teach those techniques Dr. Keller does. Most of us get squeamish when discussing some of the detoxification methods necessary to cleanse your body for healing. Not the Keller’s, instead they give you diagrams, brands of utensils, the preferred products that Morris personally found work the best and the step by step process of using them. All this indispensible information is written in straight forward, easy to understand English with virtually no questions left unanswered. 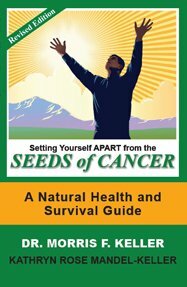 The book delves into every major cause of cancer and what one must do to remove these causes from their lives. For, unless one addresses the causes of their cancer challenge they will never be truly cured. The profoundness of this “Natural Health and Survival Guide” is SEEDS of CANCER has it all. If you, or a relative are facing a cancer challenge and you’re looking for a text on how to address it “SEEDS of CANCER” should be the first book you reach out for. This is especially true if you don’t have Internet access or if computer use is not completely comfortable for you. It’s my belief that any cancer challenge out there can be safely and completely addressed if one faithfully follows and applies the guidance given in Dr. Keller’s book. Excerpt: “Remember, that regaining ones health is like detective work. You should thoroughly explore one idea at a time. If you try to do too much at once then you will never know what worked and what didn’t. That is why we advise starting with a basic program and then gradually introduce new ideas, one at a time, for further improvement while keeping in mind that it may take several weeks or months to discern a result from natural methods. Patience and persistence is the key and not flitting from one idea to another. Lifestyle changes take time. As you learn new skills and develop healthier habits of living it will become second nature. If you are feeling overwhelmed, step back and slow down but don’t give up. It is far better to progress slowly and steadily than to carry a heavy load, rush and collapse along the way. I love this book. Not only does it tell you there are cancer remedies, SETTING YOURSELF APART from the SEEDS of CANCER even tells you how to do it. I have been longing for some practical knowledge that we can actually do. This book goes into excellent detail as to what to do. You don't know how good something is till you try it. Even things that might seem awful might turn out to be well worth it, rather than life without it. Sometimes we need to go on just respect. God says "Trust me". He really is to be respected. I think the Kellers are deserving of some good respect too. Their book tells of things I have not known...but they have. Their experience is well tested. Gee, they must know something I don't know. It bears looking into, doesn't it? Thank you, Morris and Rose for a job well done. I have to say that this book saved my life from Stage 4 Colon Cancer. The Dr.'s gave me 6 months to a year to live without Chemotherapy and 2 to 3 years to live with Chemo. I cured myself in 4 months using the methods in this book. An Oncologist is nothing more than a DRUG DEALING POISON PUSHER if I want to die from a drug it will be an enjoyable one. There is nothing enjoyable about Chemotherapy!!!! Dr. Keller, a former physician and surgeon, was diagnosed with colon and pancreatic cancer almost 40 years ago but instead of going the traditional route for treatment he chose to go a more natural and spiritual route to become healthy and ultimately beat the cancer that killed both his father and his grandfather. Keller’s book, [Setting Yourself Apart from the] ‘Seeds of Cancer’ is an extensive discussion regarding dietary changes and balancing the spirit by looking to the Bible for guidance. Keller believes Jesus was actually a vegetarian; he bases his theory on the Dead Sea scrolls and a mistranslation of the bible over time. Whether or not you believe this theory, he wants the readers to understand what a good diet free from over-indulgence in soda, sugar, fried food, and junk in general will do for one’s health and prepare them for God’s kingdom on Earth. Although the author has great intentions and sound principles in regards [to] helping Christians become spiritually responsible in how they treat their bodies and what they put into it, the 292 page paperback is densely packed with information and research—more than what can be digested in any one sitting. It must be read with an open heart and mind in order to receive the message Dr. Keller is trying to get across. I do recommend reading it, however, in the end you must remember to pray and ask for God to help guide you down a healthier physical and spiritual path. Contact Us with Your Order Today.